While I am violently opposed to the idea of bookshelves in my bedroom (I find them too distracting), I do love the look of this room and all the colour the books provide. I’m just the opposite, from childhood I’ve had books in my bedroom. Now of course it’s necessity as much as choice. I do like this room, especially the squishy chair by the bed – though I prefer cloth to leather in this climate. Oh, Claire, I couldn’t sleep in a room that didn’t have books! My dream is to have every corner of my bedroom filled with bookshelves. It’s not far off becoming a reality. 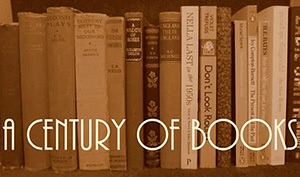 And I do like this one – but the books all look too modern for my liking. They do look “supplied by decorator”, don’t they?! But books make a bedroom so cozy, Claire! I usually like white shelves, but maybe not in a bedroom — it looks like it would be bright even at night. Love the room, though. on March 23, 2013 at 05:42 | Reply Lorraine S.
I watch HGTV’s househunting programs. Wise words to sellers- granite countertops, wood floors, stainless steel and take out the books. I have very nice cherry bookshelves in my living room and would be very annoyed to box them up! I like the room but for two things: no headboard and no reading light for we sit-up-in-bed-and-read types. I have to have books in the bedroom as that’s where my To Be Read pile – now a pair of medium sized bookcases – lives. I like to spend that last hour or so each evening reading before sleep. Oh, and yes I’d prefer a light wood to the white. Only the most deserving books are in my bedroom, and that’s quite a lot. I like to lie in bed sometimes, before getting up or falling asleep, and just gaze at the rows of books nearby, within reach. Just the sight of their covers lets me revisits the stories and characters in my mind. I’ll take this bedroom any day (or night)! I keep my books in my bedroom because they won’t fit anywhere else! 🙂 The white is very bright, but the chair beside the bed tones it down some. I’m with Claire on this – I prefer books to be kept elsewhere, but have just a few on the bedside table (night stand to those of you in the USA and Canada). And if I had this bedroom I’d feel compelled to straighten the books so that they would stand upright and not look like drunken sailors leaning against lamp posts! I would also have to remove the plant on the window sill as I’d surely knock it over when I turned over my pillow during the night, to seek out a cool spot! The chair is a little too close to the bed, too. That would have to be moved every time someone wanted to get in or out of bed on that side. 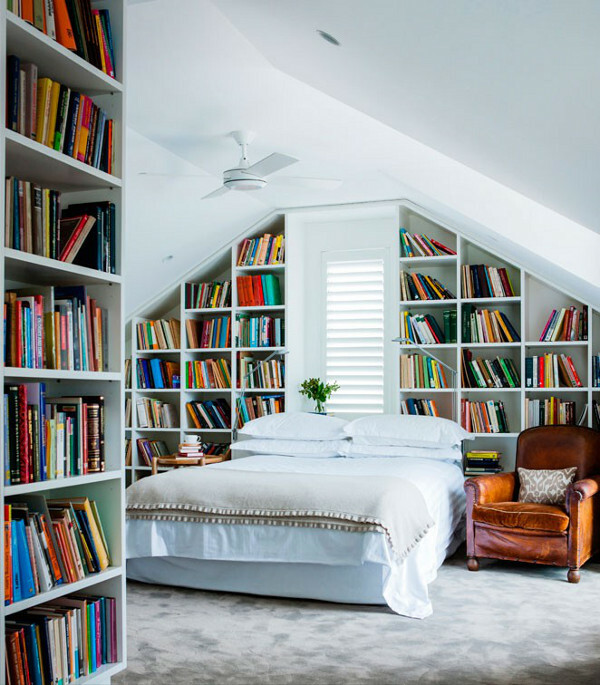 Overall, I think this is style over content, attractive, but not my kind of bedroom/bookroom at all. I like the concept, but I don’t do white, and carpet makes me sneeze! But I love the shape of the room, with that attic/loft roof, and I’d have those shelves double-stacked with my bookish treasures. Needs a reading light (or two) was my first thought, but a closer looks reveals that there are indeed two small lamps (long-armed variety) above the bed. The chair looks like a toe-stubber, though – needs to move over a bit. I’m with you on this. I have books in the bedroom now because I ran out of anywhere else to put bookshelves, and I do like looking at them, but honestly it would be nice to have one book free room. If I had a guest bedroom though it would look a lot like that.